BONSAL (June 7, 2009. )- On the first Sunday of most months, hundreds come to this small town, about half an hour southwest of Raleigh, to get a close look at old trains. But few, if any, have gotten as close a look as Brian Kielty got Sunday -- and certainly not without paying the fare. Kielty, 50, of Apex was driving about 10 mph in a 21-year-old, blue-with-wood-trim Mercury Colony station wagon, approaching a railroad crossing on Daisey Street shortly before 4 p.m.
he driver simply failed to stop, or if there were mechanical problems with the car. Problem is, a New Hope Valley Railway train, operated by a volunteer crew as part of the N.C. Railroad Museum, was making use of that crossing at the time, finishing a nine-mile trek carrying about 100 train enthusiasts. "You're obviously not going to move a train with a car, especially at that speed," Trooper Ricardo Quiñones said. Nobody was injured in the collision, which happened near the Chatham-Wake county line, Quiñones said. But he estimated that there was about $1,000 in damage to the train. The station wagon was rendered undriveable. Kielty said he was all right, but he declined to comment further before eventually being driven home by a family member. Kielty was charged with failure to reduce speed, Quiñones said. "I've never seen anything like this," said the seven-year law enforcement veteran. Indeed, train-on-car collisions are the ones we tend to remember, not the other way around. But Bob Crowley, corporate secretary of the New Hope Valley Railway, says it's much more common than one would think. "You'd be surprised at the number of people who just don't pay attention and drive into the side of the train," he said. Yet it's never happened to New Hope Valley Railway, he said. For 21 years, Triangle train fanatics have flocked here to ride the New Hope Valley Railway. The rides run on the first Sunday of each month from May to December, and have been known to draw 1,000 passengers a day for five round-trim runs on 41/2 miles of track in Chatham and Wake counties. Tickets usually sell out weeks in advance. The volunteer organization, with about 100 members, maintains and operates seven locomotives, including one of about 100 steam engines still in operation in the country. Engine No. 17 was pulling the 50-year-old excursion car that was struck in the wreck. 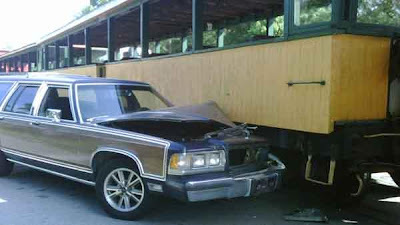 The collision caused the railway to cancel the day's last run. But the trains are expected to run on schedule next month, Crowley said. "About the only thing we're going to have to do different," he added, "is put a little paint on the car." haha i live in raleigh, all i got to say is HOW DO YOU NOT SEE A TRAIN! Good thing no one was hurt, shame about the car though, looked like it was a really nice old wagon. I just want to know how you drive into a train, going 5 mph, and it is painted bright yellow!!!!! !